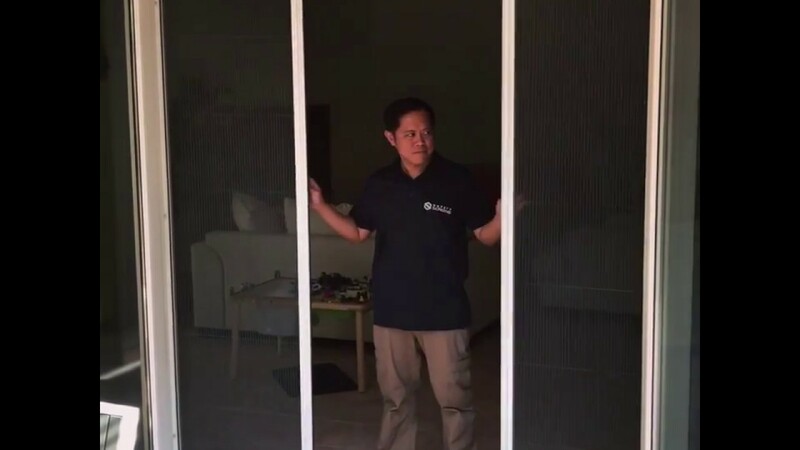 At FlyScreens.ae we only do one thing… door and window mesh screens. That’s it. Nothing else. No distractions. We are the experts in providing you with a simple range of fly screens for your home. Whether it’s a new fly screen you desire or to replace your existing worn out screen then we offer a range of options. Our fly screens are suitable for all types of openings, including sliding doors, French, bi-fold, normal hinged doors, and all window openings. Our recommended affordable fly screen is the ‘pleated’ screen. This screen offers great protection against all insects and is available in a range of options to suit villas found in Dubai, Abu Dhabi and across the UAE. This is a new design now available in the UAE and is gaining great popularity across the world. Its modern design is the perfect insect barrier for tenants and home owners who require a functional screen that will last, at an affordable price. The pleated screen is suitable for installing alongside all existing doors and windows. Folded away when not in use, therefore not being exposed to the sun. Functional easy to use design. Quality polyester mesh designed to withstand the harsh middle east environment. Powder coated for high levels of protection and years of use. Last longer than normal fiberglass screens found on most UAE villas. Perfect for all door types including sliding doors, French doors and hinged doors. Contact us today to arrange a free measure and quote for the most innovative and modern screens on the market. Is a cost effective solution for tenants and villa owners. A wide range of affordable options. Closes with a simple magnet locking system. The pleated screen is the perfect design for the UAE because, like an accordion, the screen folds into itself when it’s closed, thereby not being exposed to the harsh UAE sun. Excellent product and excellent service. Cannot recommend James and his team enough. Our pleated fly screens are not just a brilliant idea, but also great quality and so smart… out of the way when not in use, and they look great when in use too. We’ve already had lots of compliments about our new screens 😉 Many thanks! I love our new fly screens! They are much more sophisticated than any other screen system I’ve seen in Dubai! Thanks for the professionalism and for the quick and efficient installation! Highly recommended! Just had our screen installed and we love them! James, Kat and the team were very friendly and approachable and helpful in finding solutions for the installation of the screens. They were timely and neat in getting the job done, very professional. We are especially happy about the child safety screen as they are tough as nails and we don’t have to worry about having the windows open in our daughter’s room thanks to that! The retractable screen frames were also coloured to match our own door frames so you don’t even notice it is there. Highly recommended! Well done you guys! Our pleated fly screens are custom manufactured to your exact requirements. The screen mesh is made from a quality polyester yarn and secured in a powder coated aluminium frame. These quality fabrics are backed by a 5 year warranty on the frame and component parts, and a 1 year warranty on the polyester mesh. The pleated screen is also designed for easy screen replacement should you need to change the mesh in the future. With a small amount of maintenance, your screens will withstand the UAE’s tough weather conditions. At FlyScreens.ae and our sister company Safety Screens, we only do screens. Insect screens, fly screens, security screens and nothing else. We don’t get distracted by other things. We love keeping all types of bugs out of your home! We come to work each day to custom build insect and security screens. Our team of qualified metalsmiths and engineers are experts in their field. They install the screens they build so they ensure each screen is fabricated to fit and last. They don’t want to be going back out in the hot sun to repair a screen. They do it right the first time. Having started Safety Screens last year which focused on premium security screens, we received a large number of enquiries for a more affordable fly screen. We were aware that pleated screens were becoming more popular and affordable and we’ve always liked their innovative design. As such, FlyScreens.ae was born to offer this great screen, and other screens, in Dubai and across the UAE. We hope you will also enjoy the benefits of our pleated screens on your doors and windows today. Please feel free to contact us to arrange a free measure and quote. Please feel free to contact us by completing the email form below, WhatsApp us, or call if you have any questions or would like to arrange a free measure and quote. Copyright © 2018 Fly Screen Doors and Windows. All rights reserved.